I figure that this is my last best chance to earn the title of "dickhead" from Eddie Irvine. 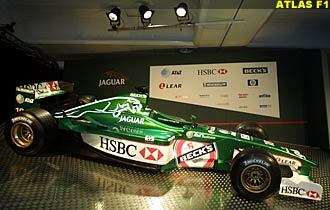 You remember what Eddie stated in F1 Racing about Jaguar? "Look," he said to Matt Bishop, "anyone who criticises us, to be honest, is a dickhead. Because if you criticise us, it means you just don't understand the enormity of the task we're facing." Well, there were legions of dickheads in 2000, and I was one of them - early in the season questioning Ford's decision to shift the Stewart operation from Ford to Jaguar. Nothing that happened during the year suggested that I was wrong. Looking back, it's clear that Jackie Stewart had run a very canny operation, as you would expect of this shrewd Scot. When I went up to Milton Keynes to sign books with Jackie, he gave me a tour of the Grand Prix facility. The shops and their personnel were adequate - but only just. Stewart believes in keeping his books balanced. It was obvious that he had not overspent against his budget from Ford and his other backers. We have to give him and his team a lot of credit for achieving as much as they did with, frankly, a marginal allocation of resources to an organisation that had to be built up utterly from scratch. 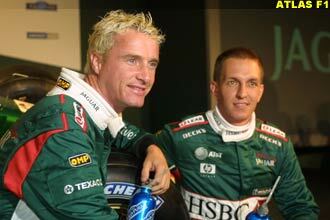 So for our bleached-blond Ulsterman the move from Maranello to Milton Keynes must have been quite a shock. He told F1 Racing that "we're a very small team with a lot of inexperienced guys. Let's say there are a lot of young guys who need to learn - and I hope they are learning." To boot, he added, "we did lose some key people between when I signed and when I got here. And that made life difficult." Notably missing from the Jaguar strength after April 2000 was cancer-stricken Paul Stewart, whose past experience as Stewart's managing director would have made a huge positive contribution. The loss of aerodynamicist Egbahl Hamidy to Arrows was critical as well. Eddie's youngsters had a lot to learn from in 2000. It's hard to put Cosworth in that category, but they did have their problems. They tried to fit a 96 mm bore in a block whose cylinders were only 99.5 mm apart, leaving walls so thin that the block distorted, the head cracked and the water and oil mixed. For Hockenheim, Cosworth adopted the short-term fix of using its 1999 heads on the 2000 block. Using a common oil system for the engine and the gearbox caused problems that had to be fixed by separating the two systems. The gearbox itself was not reliable and the clutch was so unpredictable, that Irvine said: "You let the clutch in and nothing happens and then it goes in with a bang and you are sitting there with a lot of wheelspin." The changes, including a power-steering system that added 7 pounds, tended to raise the car's center of gravity. This in turn exacerbated a problem that Irvine had noticed when he first drove the Jaguar-to-be: the back didn't want to stay behind the front. Only at Spa was the fault diagnosed. When the ground clearance exceeded 65 mm - 2.6 inches - the underbody lost downforce at the rear. This was especially harmful under braking when entering corners. If the car were trimmed lower, its drag became excessive. After this diagnosis, improvements were made, although the use of a wind tunnel in California poses obvious limitations. The rear suspension was an obvious trouble spot, even before it broke and injured Johnny Herbert at Malaysia. Promoting Luciano Burti from tester to racer. The Brazilian certainly showed his speed and coolness when he was given the wheel in Austria. On that basis alone he merits a seat in the old tradition of David Coulthard and Damon Hill. But who has replaced Burti? An experienced Formula One racer - someone like Panis, Wurz or Zonta, who has competed at the top level? A knowledgeable driver of the high caliber that recent seasons have shown to be essential to prepare the cars properly? No. Instead they've engaged Tomas Scheckter. Not a good move. At the launch of the 2001 R2 young Scheckter said his goal for the season was "to get to know a Formula One car, how it works." This is the wrong way round. At the top level of the sport, the tester's job is no longer one in which to train youngsters in the art and science of Grand Prix driving. He should be learning that by driving for a "B" or "C" team. But I guess that would be below his dad's dignity - or too big a burden on his bank account. 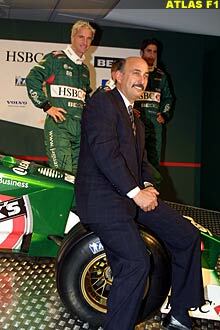 Engaging Bobby Rahal to run the team. Apparently Neil Ressler did a heck of a selling job on Bobby, because the latter said that "Jaguar has all the resources in the world - and tremendous capability." This has to rank with the snow job that Tom Walkinshaw did on Damon Hill to get him to drive for Arrows. Never mind; Bobby now knows the actual situation. At least Rahal is a racer, but he'll need a few seasons to come to grips with Formula One as it is today. I like one rumour: that Rahal was picked specifically because he is friendly with Adrian Newey, who was his racing engineer in the 1984 and '85 CART seasons. The aim is to get Newey on board at Jaguar when his McLaren contract expires at the end of 2002. As a friendly gesture Jaguar loaned Newey an SS100 to drive in last year's Mille Miglia. Firing Gary Anderson and engaging Steve Nichols as technical director. Where is this leading? Anderson has been struggling with a decimated engineering staff and a wind tunnel in California; how is Nichols going to do much better? He can in the long run, because I believe him to be a better team-builder than Anderson, who tends to the lone-wolf approach. As one Formula One engineer told me, "Gary is one of the most outstanding racing engineers I've ever known. His skills would have been ideal 20 years ago when one man could design the whole car. But now it's so complex that it has to be a team effort." At the R2's launch, Gary Anderson was a non-person; he went unmentioned by all speakers or press material. Yet the new Jaguar was designed completely under his direction by ex-Williams man John Russell and aerodynamicist Darren Davies. Announcing a big new center for building cars and engines at Silverstone. Why, pray tell, on the very doorstep of Silverstone, only a stone's throw from Jordan? The smart outfits set up their factories far from the crowds, press and public, so they can control their operations closely and confidentially. Look at McLaren, Ferrari, Williams and Arrows. In their factory siting, Jaguar seem beset by the same "edifice complex" that had them building the most outrageously pretentious hospitality vehicles ever seen in the Formula One paddocks. Once again their desperate desire for a public shop window has ruled against the best decision for the benefit of the team. Downplaying expectations for the team's achievements in 2001. A long-overdue step, this was the objective of Bobby Rahal at the R2 launch. Absolutely no forecasts were made for any level of achievement by the team - no talk of wins, podiums, points or placings. Rahal simply said, "Our aim this year is to achieve respectability." He didn't define what he meant by that; some of the team members weren't even sure. It's a very good goal, one with which I heartily agree. Jaguar can't afford another season as the laughing stock of the Grand Prix world. As you can see, I have more than earned Eddie's sobriquet. What Irvine may not understand is that a certain amount of criticism may be helpful to Jaguar. Companies like Ford and Jaguar are sensitive to criticism. They may pay attention to it. They may even act upon it. Dickheads have their uses too.